(Photos) Seen across street after blasts talking with FBI bomb squad. Who were they? What were they and the FBI doing? 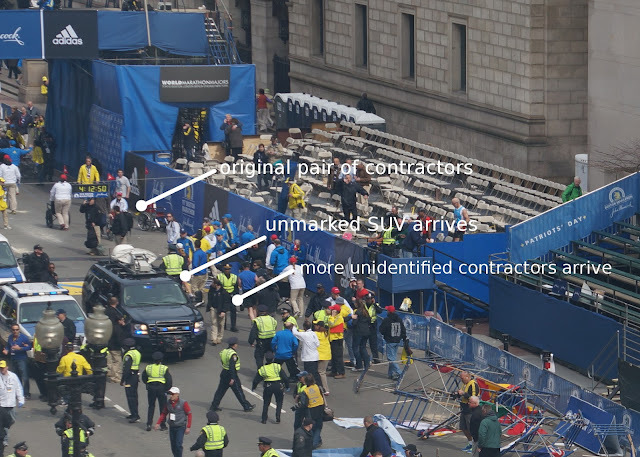 April 19, 2013 (LD) - What appear to be private contractors, wearing unmarked, matching uniforms and operating an unmarked SUV affixed with communication equipment near the finish line of the Boston Marathon shortly after the bomb blasts - can be seen beforehand, standing and waiting just meters away from where the first bomb was detonated. 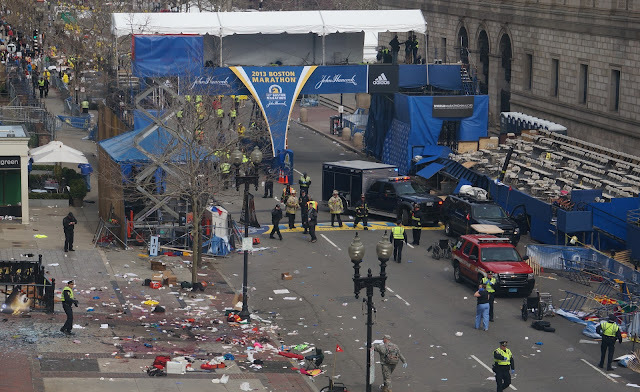 The contractor-types had moved away from the bomb's location before it detonated, and could be seen just across the street using communication equipment and waiting for similar dressed and equipped individuals to show up after the blasts. 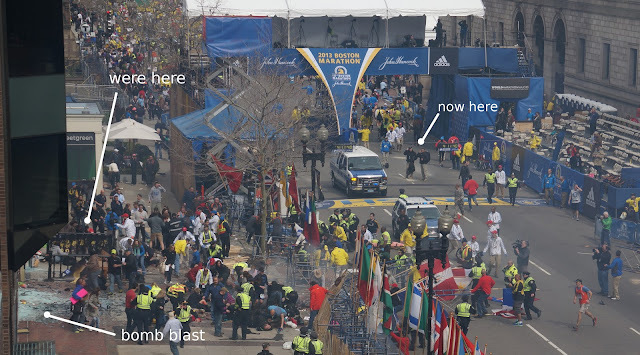 Image: An already widely distributed photo showing the contractor-types on the bottom left, just left of where the bomb was placed and detonated. The men are wearing matching, unmarked uniforms, large black bags, and appear to be waiting, separately, and "behind" the rest of the crowd. In the upper left corner, a wooden structure forming one half of a temporary photography "bridge" over the finish line can be seen and serves as a useful reference when establishing the contractor-types' position in other photos. The men, numbering between 6-8 then begin tearing up the skirting around temporary bleachers erected for the event, opposite the explosion, before taping it off. Then, what appears to be an FBI bomb squad truck pulls up directly behind the contractor-types' SUV, with a woman clearly wearing the letters F.B.I. on her tactical vest emerging and speaking with the contractor-types. Together they disappear from the scene, leaving their vehicles behind. It should be noted, that with the exception of the contractor-types, all other responders at the scene, including the FBI agent, can be clearly identified, from police to the fire department, to medics and even individuals wearing vests with "B.A.A. Physician" written on them. It should also be noted that no other uniformed individuals can be seen standing near the bomb site aside from the contractor-types. These men were unidentified, professional contractors apparently augmenting public servants at the Boston Marathon, present before and after the bomb blasts in the direct vicinity of the incident. 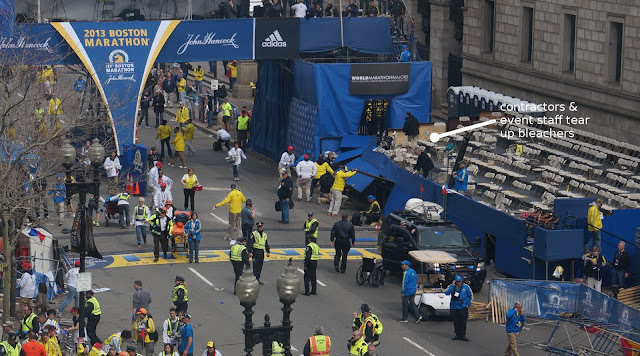 After the blasts, whether it was their intended function or not, they appeared to be searching for something under the bleachers before being joined by what appears to be the FBI bomb squad. The FBI and the city of Boston has so far categorically failed to provide any information on these highly suspicious individuals. Several questions must be answered by the FBI, leading the investigation on behalf of we, the American people. The first question is who these men were, with large, black bags in the direct vicinity of where a bomb would detonate, moving away before the blast, and appearing directly across the road afterward. Who hired them and what was their function? Why were they moving amongst the crowd in a semi-covert fashion when all other public servants present were wearing proper uniforms and clearly identified? Did police, firefighters, event organizers, and medics know these men were present and what they were doing? 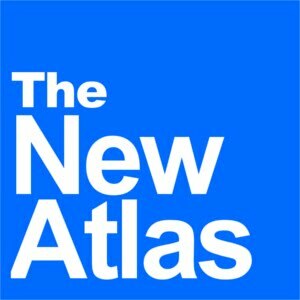 Why did it appear that the FBI was fully aware of their presence, and in fact working with them, specifically with what looks like a bomb squad unit? 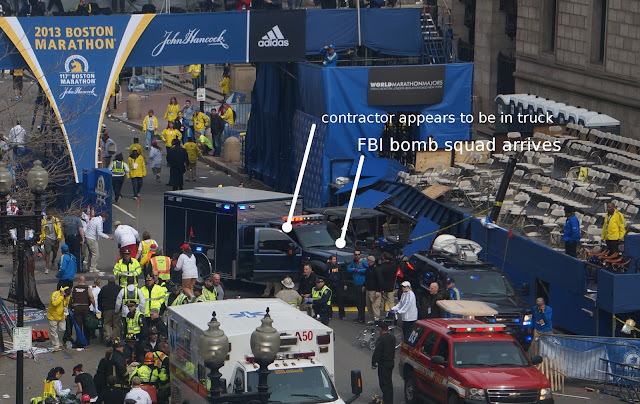 Were these contractors specialists in explosives, and if so, what is the significance that at least two of them were spotted just meters from where the blast occurred? The checkered, frightening history (see: FBI's History of Handing "Terror Suspects" Live Explosives) of the FBI's involvement in fomenting false terror attacks, and even presiding over attacks that succeeded in maiming and killing innocent people, should call into question their presence or involvement at any public event, especially when seen associating with unidentified, semi-clandestine organizations that appear to be private contractors. Private contractors as well, do not answer or work for the public, but rather the highest bidder. Private contractors, most notably Blackwater and its various incarnations have operated both domestically and abroad, committing obscene crimes and atrocities with seemingly absolute impunity. The term "defense contractor" is in fact a euphemism for mercenary, and has no place in a civilized, democratic world, no matter what their alleged mission statement may claim. That both of these nefarious entities were present and cooperating in the direct vicinity of the Boston bombings, with at least two contractors standing just meters away from where the bomb actually went off, raises a number of possibilities and concerns. A drill may have been being conducted, though the FBI and city officials have denied this. 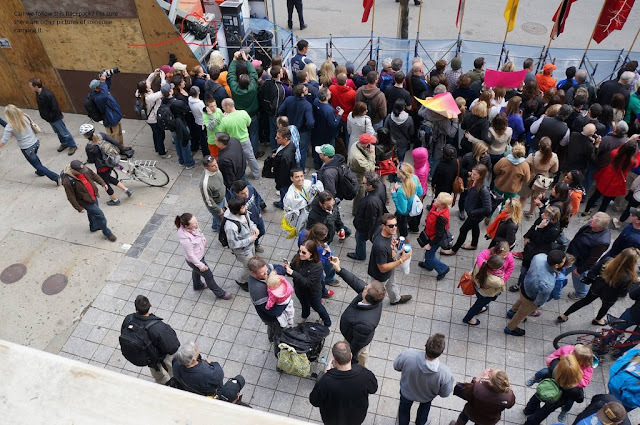 Or, a threat may have been communicated to event organizers ahead of time, which prompted the inclusion of "auxiliary" security, though again, both the FBI and the city of Boston deny receiving any information prior to the bombings. Whichever contracting firm this may have been, may just have wanted to swindle Boston's taxpayers for an easy payday, and coincidentally found itself in the middle of extraordinary circumstances. However, alarming suspicion is raised when the FBI makes no mention of an organization it was clearly coordinating with, particularly in terms of bombs and explosives before and after the incident, considering the nature of the attack. When an already dubious organization attempts to obfuscate the facts of any given event, it is the right and responsibility of legitimate law enforcement, public representatives and the citizenry itself to demand and get answers. If we are not persistent, with the FBI's bizarre behavior over the past few days, including inexplicably cancelled and suspiciously rushed press conferences, and now what appears to be a Hollywood ending for the case, we may never get those answers. 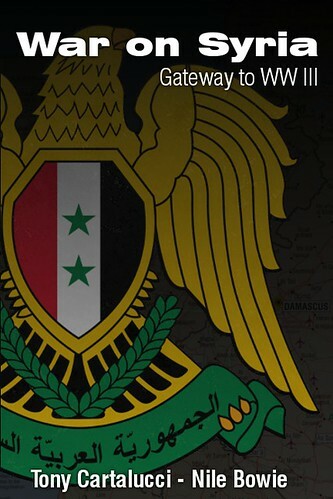 Note: Most images were taken from Flickr user HahaTango, the entire collection of 150 images from the Boston Marathon can be found here.